← How do you spell No More Snow!! Basically you cook the pasta, I used whole wheat penne. When it’s cooked to your desired doneness you drain it. You then drizzle it with olive oil and then sprinkle it with the cheese. Our preferred variety is Locatelli parmesan. That’s all I do for Ralph. 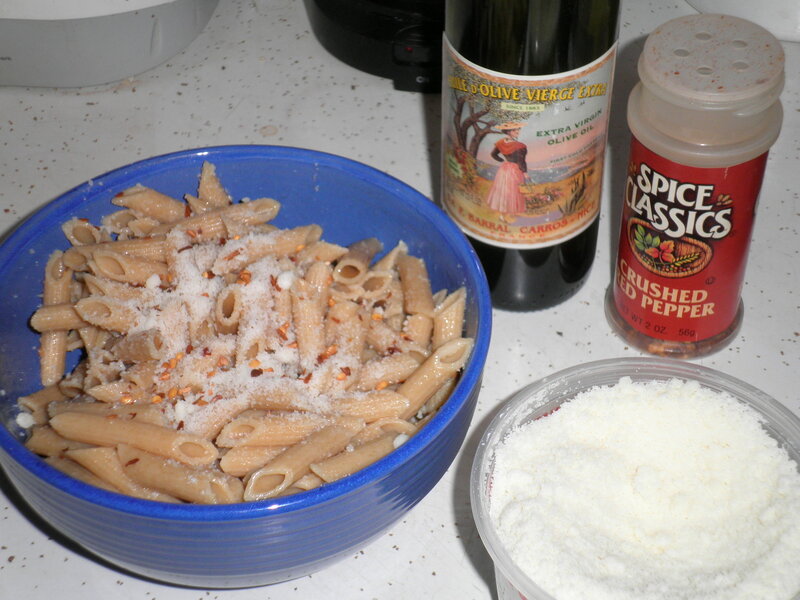 For myself, I add crushed red pepper flakes and usually garlic powder. I completely forgot the garlic powder until I was almost finished but it was delicious anyway. I guess that’s where the problem lies with not using a recipe, much easier to forget ingredients! It didn’t matter…I finished every morsel and enjoyed it enormously since we hadn’t had it in a while! I did have trouble last night nosing around the kitchen for snacks, but I kept myself under control with a banana. When I got to Weight Watchers today, I found that I had lost a pound and a half and best news of all, I am Free again! I’m going to work hard to keep it that way. That bothers me more than the gain, I hate to pay. I worked too hard to be Free and I’m staying that way! I have to work harder, figure out how to curb my snacking urge and keep exercising. The pasta didn’t hurt this time and with some of my new grocery purchases, I hope to stay on track. I can do this! This entry was posted in Uncategorized and tagged pasta, vegetarian, Weight Watchers. Bookmark the permalink.